27 years, 7 months, 25 days old age. Alex Carey will turn 28 on 27 August, 2019. Only 4 months, 5 days, 25 minutes has left for his next birthday. Alex Carey has celebrated the total number of 27 birthdays till date. See the analysis by days count and bar graph. Alex Carey was born on 27-08-1991 in Loxton in the state of South Australia, Australia. He is an Australian Cricket Player. Alex Carey started his career in Australian Rules Football. He also was the captain of his side in the year 2010. After he was dropped from the side in 2012, he started playing cricket. His innings in new sport didn’t started the way he wanted. He, however, won himself a contract with South Australia in the 2013-14 season. He along with batting decided to hone one more skill and thus donned keeping gloves. After playing grade cricket till 2015-16 season, he was finally inducted in his state’s senior team. In the 2016-17 domestic season, he scored over 500 runs and also affected 50 dismissals. This performance of his caught selector’s eyes and he was given an opportunity as Matthew Wade’s form also started dipping. 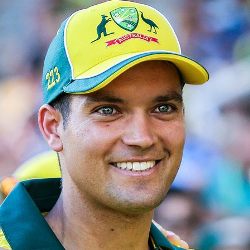 He was finally included in Australia’s squad when England toured Australia in 2018. Since then, he has been a regular member of Australia’s ODI and T20I team. After some impressive performance in T20I, cricket, he was also made the vice-captain of Australia's T20 squad. It was a close call between him and Peter Handscomb for a berth in 2019 World Cup squad. Finally, it was him who got the opportunity to represent Australia at the 2019 ICC Cricket World Cup. He was born to Tyson Carey. He is married to Eloise Carey and together the couple is blessed with a son named Louis. He used to play Australian Rules Football prior to becoming a cricketer. He has also captained the AFL team Greater Western Sydney Giants in 2010. After playing just a few T20 games, he was made the vice-captain of the Australian T-20 squad.